Money matters — it’s a maxim of Prof. Milton Friedman that I repeat often in my columns. Since the Northern Rock bank run of 2007 — the "opening shot" of the financial crisis — the money supply, broadly measured, in the United States, Great Britain, and the Eurozone has taken a beating. Recently, in the United States, money supply growth has started to rebound, but only slightly. In the U.K. and the Eurozone, things are much worse. This is cause for concern, because the quantity of money and nominal gross domestic product are closely related. Not surprisingly, in the U.S., growth has been anemic, at best. In the U.K., the economy has fluctuated between stagnation and recession. And, in Europe, growth has been replaced by the Eurozone’s longest recession ever. Indeed, 9 of 17 E.U. countries that use the euro are in a recession, including France, and Eurozone unemployment sits at a record 12.1%. When it comes to measuring the money supply, we must heed the words of Sir John Hicks, a Nobelist and high priest of economic theory: There is nothing more important than a balance sheet. These sentiments were recently echoed by my Parisian friend, former Governor of the Banque de France Jacques de Larosière, in his 17 April 2013 lecture at Sciences Po. 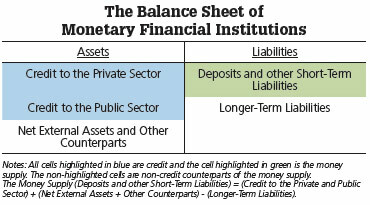 Components of the money supply appear on a bank’s balance sheet as liabilities. The money supply is simply the sum all of the deposits and various other short-term liabilities of the financial sector. On every balance sheet, the sum total of assets must equal total liabilities. In consequence, the money supply (short-term) liabilities) must have either an asset or longer-term liability counterpart on the balance sheet (see the accompanying chart). One of these counterparts is known as credit, and it includes various financial instruments, such as private loans, mortgages, etc. Money and credit are often confused as synonyms, but they are not the same thing — credit is a counterpart to money. Any economist worth his salt should have the money supply on his dashboard. But, it is also important to look at what the financial sector is doing with these deposits — are they lending this money back out to the economy, and if so, to whom? There is one very important counterpart of the money supply that is particularly worth looking at — loans to private individuals and businesses, known as "private credit." In the Eurozone, the growth rate in the money supply has historically moved in the same direction as private credit growth. Recently, however, this relationship has reversed. 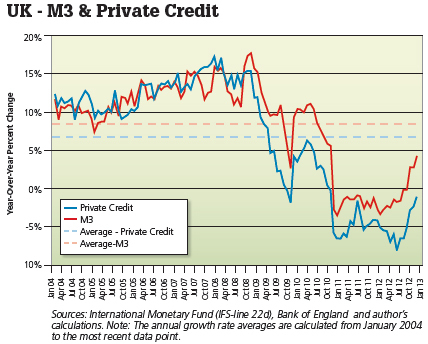 Despite a very modest rebound in the annual growth rate of the money supply (3.1%), growth in private credit has turned sharply negative, indicating a severe credit crunch (see the accompanying chart). 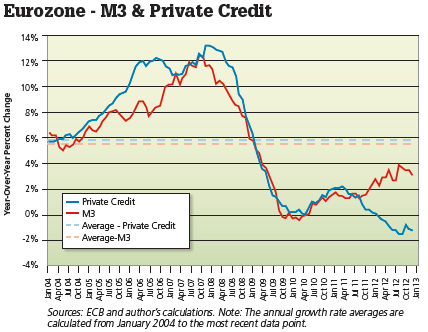 How can Europe’s money supply (M3) be growing while private credit is shrinking? First, it is necessary to determine what is driving money supply growth in the Eurozone. As it turns out, a whopping 40% of the contribution to the growth in M3 over the last year has come from an increase in bank lending to governments. Another 40% of this growth in M3 has come from a decrease in banks’ long-term liabilities. To understand how this would increase the money supply, consider the following example: If I own a long-term bank bond, and the bank then retires that bond, I will take the money I receive as a result of this transaction and put it into my bank account. Hence, the money supply (deposits) increases. In short, government borrowing and the restructuring of the liability side of bank balance sheets is pumping up the Eurozone money supply, while private credit remains in the doldrums. Things are not much better in the UK, where annual growth in private credit has been negative since December 2010 and is shrinking at an annual rate of -1% (see the accompanying chart). In the United States, the picture is only slightly better. As the accompanying chart shows, private credit and the money supply are growing at their historical average rates. That said, the total money supply is still 9.1% below its trend level, while private credit remains 7.2% below its trend level. As we turn towards Asia, things start to look brighter. Unlike the major Western economies, China has seen growth in the money supply and private credit on par with its historical averages (see the accompanying chart). What sets China apart is its performance in the early months of the financial crisis. Rather than bashing its banks, like most other countries, China loosened the reins on the financial sector. Following the September 2008 collapse of Lehman Brothers, China unleashed a flood of private credit via its banking system. This helped China "weather the storm" and sustain growth at a robust pace, while Western economies were struggling to stay afloat. Not only did this save China from the financial fate of the U.S. and Europe; it also staved off a collapse of the Chinese financial sector, which would have devastated the region’s economy. While China’s money supply has dipped slightly below the trend-rate level in recent months, GDP growth has remained relatively strong. But, the Asian story does not stop with China. Indeed, most Asian economies are currently registering money supply surpluses, or only minor deficiencies. This is the case because of the so-called hot money flows that have been pouring into Asian economies, including China’s. This term describes the flows of funds that have resulted from investors in developed countries (with lower interest rates) allocating ever-increasing amounts of capital to investments in developing countries (with higher interest rates). 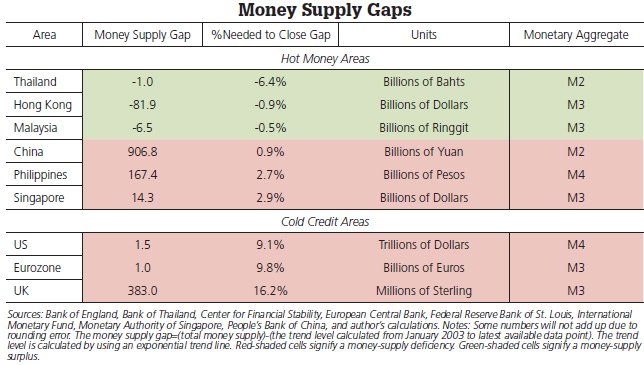 In recent years, these hot money flows out of the U.S. and Europe have helped pump up the money supply in Asia (see the accompanying table). Hot money flows have resulted in a substantial influx of capital into the Asian financial sector. 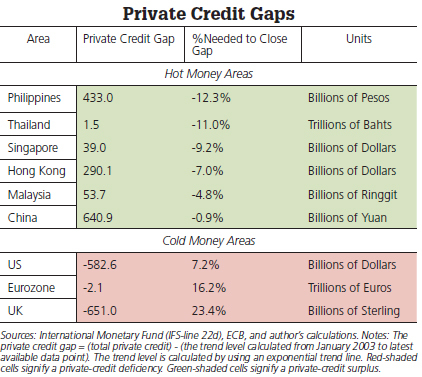 Indeed, when we view this phenomenon in terms of counterparts of the money supply — private credit, in particular — the picture comes into sharp relief (see the accompanying table). Hot money flows have finally caught the attention of Federal Reserve Chairman Ben Bernanke. In a recent speech, he warned against "excessive risk-taking," expressing concern over investors "reaching for yield" by investing in emerging markets (read: hot money flows). The irony is that Chairman Bernanke himself is squarely to blame for this phenomenon. After all, yield-chasing results from investors in countries with ultra-low interest rates seeking a higher return by investing in countries with higher interest rates. Yes, Bernanke and his counterparts at the European Central Bank and the Bank of England have manipulated interest rates in the U.S. and Europe down to nearly zero. In consequence, traders, portfolio and pension managers, etc. have allocated capital wherever they can earn a return. For a pension fund manager who is obligated to generate a return of, say, 6%, there is a strong incentive to "chase" after the higher yield to be found in places like China. Incidentally, the search for yield also helps explain the recent bull run in the U.S. equity market. So, when it comes to Bernanke’s yield-chasing/hot-money bogey man, it would appear that the Chairman has only himself and his fellow central bankers in Europe to blame. Chairman Bernanke has turned on the Fed’s money pumps to try to prop up the lackluster U.S. economy. But, since the Fed-produced "state money" component of the total money supply (monetary base) accounts for only 16% of the total (Divisia M4), these efforts have fallen woefully short of closing the U.S. money supply gap. In consequence, Bernanke’s ultra-low interest rate policies have only succeeded in generating yield-chasing, while the total money supply remains 9.1% below trend. There are two main factors that have hampered broad money growth in the United States since the financial crisis. Not surprisingly, they are both government created. The first is the squeeze that has been put on the banks, as a result of Dodd-Frank and Basel III’s capital-asset ratio hikes. By requiring banks to hold more capital per dollar of assets (read: loans), the regulators have put a constraint on bank’s balance sheets, which limits their ability to lend (create private credit). In consequence, money supply growth has been slower than it would have otherwise been. The other factor is the credit crunch created by the Fed’s zero-interest-rate policy itself. This has dried up the interbank lending market, because banks have little financial incentive to lend to each other. Without a well-functioning interbank lending market to ensure balance sheet liquidity, banks have been unwilling to scale up or even retain their forward loan commitments. The end result is a loose state money/tight bank money monetary policy mix. Since bank money makes up 84% of the total, the U.S. money supply, on balance, remains "tight." Clearly, central bankers in the U.S. and Europe have misdiagnosed the patient. Bernanke and company should reread Prof. Friedman on money and Prof. Hicks on the importance of balance sheets. Alas, the contradictory monetary policy mix coming out of Washington, Frankfurt, and London shows no sign of letting up anytime soon. Meanwhile, the Asian story still appears to have legs. So long as the United States, Great Britain, and the European Monetary Union continue to embrace this schizophrenic monetary policy mix, hot money will continue to flow abroad, and credit at home will remain cold.